Recognition is an important component to member engagement, recruitment, and retention. Each year, CACUSS honors/provides recognition to exemplary higher education and student affairs leaders, students, programs, and initiatives for contributions and impact on the field. Recipients of CACUSS Awards are a lens on the important and diverse work CACUSS Members undertake. The honourees serve the field and enhance the lives of their campus communities. These are normally awarded during the Annual Conference. The Awards Committee coordinates CACUSS’ annual awards & conference bursary process to recognize outstanding professionals, scholars, programs, mentors, colleagues, and graduate students through our Association-wide awards. Established 1996, the CACUSS Award of Honour is the highest honour given to a member of CACUSS. The award will be given on the basis of merit and presented at the annual CACUSS conference. Normally, no more than two awards will be given in any one year. 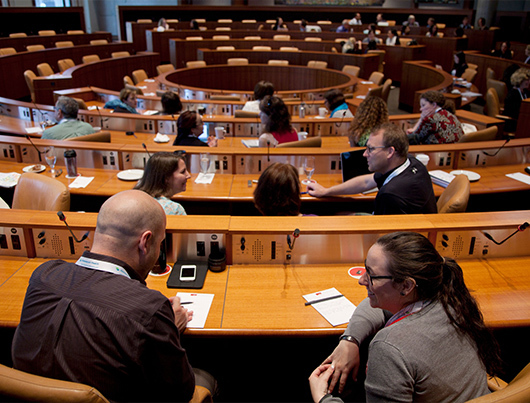 Active participation within CACUSS, committees, or communities of practice. Active participation includes long-standing involvement with the association through participation at annual CACUSS conferences, workshop facilitation, presentations, undertaking research, mentoring, leadership or advocacy on a national issue, distinguished service on the CACUSS Board of Directors and/or significant leadership in a Community of Practice or committee. Award of Honour recipients are well-respected contributors to Student Affairs in Canada, and have made significant contribution to their campus communities. Award recipients shall receive an etched glass plaque/trophy and a certificate. The awarding of the certificate and acknowledgement of the honoree will occur at the Annual CACUSS Conference and award winners will be profiled in a significant way through CACUSS communication channels. A letter of acknowledgement will be sent to the recipient’s institution. A minimum of two letters of support detailing the extent to which the candidate has met the criteria for consideration, outlining their contributions and service to the profession, their campus, and CACUSS. How the nominee has demonstrated significant and distinguished contribution over a number of years advancing student affairs and services on their campus and beyond (e.g. regionally, provincially, or nationally). Other contributions (national initiatives, advocacy, mentoring, research etc.) that have impacted the profession regionally or nationally. Describe the nominees advanced mastery in most areas of the CACUSS SAS Competency model. Award of Honour nominees will be reviewed using the above criteria and names of nominees will be submitted to the Board of Directors for approval. Advanced mastery in most CACUSS SAS Competency areas. Click here to see the Rubric the committee will use to evaluate this award. CACUSS members who have retired or are retiring from their position in Student Affairs in a post-secondary institution may be eligible for Life Membership in CACUSS. Life Membership recognizes the career and milestone of retirement of an individual whose impact on their campus or to CACUSS is to be acknowledged and celebrated. Communities of Practice, CACUSS members, and Directors may nominate individuals who have retired from their position in a post-secondary institution for the Life Membership in CACUSS. Life Members are exempt from payment of dues to the Association but retain all rights and privileges of dues paying members, except for holding office or voting. Life Members are awarded a certificate at the Annual Conference. The nominee must have been a member of CACUSS in the last 5 years, and had active membership over the course of their career. The nominee is retiring in the year prior to the conference or between May 1 and April 30 of the current year. Nominees for Life Membership are approved by the CACUSS Board of Directors. An online application should be submitted nominating the individual. The individual may also be recommended in writing to the CACUSS Board of Directors prior to May 1. The Leaders in Learning Award is named to acknowledge the CACUSS Identity Project launched in 2012-2014, and the resulting organizational change which enhanced our membership structure through the creation of Communities of Practice and Networks. This award recognizes outstanding individual contributions to professional development activities (e.g., publications, contributions to knowledge creation and dissemination, online courses/webinars, conference presentation, workshops, etc.) It also recognizes outstanding service and leadership to CACUSS and/or a Community of Practice as a chair or participant in a Community or Committee. The nominees should demonstrate a commitment to advancing the CACUSS SAS Competency Model in their work and practice in supporting the learning of members. Nominations for this award may come from any CACUSS member or CACUSS staff person. Recipients will receive a framed certificate and a letter to their immediate supervisor and VP or President of their home institution. Recipients will be acknowledged at the Annual Conference. Submit online application. Additional letters of support are optional but recommended. Must be a current member of CACUSS. The individual must have contributed in a significant way to either leading their Community or to the development of an initiative that has a direct benefit to other CACUSS members (such as a course, event, or publication). The contribution and the extent of its impact must be demonstrated in the nomination or supporting materials. The New & Emerging Professionals Award recognizes leadership, growth, and outstanding potential of a professional working in any area of student affairs and services for 5 years or less. The individual has demonstrated significant growth in the CACUSS SAS Competencies. The recipient will receive an etched glass award/plaque. The Award will be presented at the Annual Conference. Submit nomination application online. A minimum of one letter of support from the individual’s supervisor, or colleague(s) should be submitted. A current resume or C.V. of the nominee should be provided. The nomination and support letter(s) clearly outline the ways in which the nominee has made an impact and gone beyond their role on their campus. Ways in which their commitment to excellence and improving student services should be demonstrated. The extent to which the individual will contribute to the field and the profession. Specific examples of the nominees service, growth in competency areas, and leadership should be provided. The nomination/application should demonstrate innovation that builds on/reflects these areas. The recipient program/recipient institution will receive an etched glass award/plaque recognizing the name of the program and if applicable, the institution(s). The department and individuals involved in its development/execution and success. Supporting documentation (letters of support and/or additional materials) that describe the program and demonstrate program/service success/impact must be submitted with the nomination/application. The nomination/application must clearly outline how the program or service is innovative. Results and metrics which have demonstrated the success or innovation of the program, and the impact that the innovation has had on students, faculty, staff, and/or the campus community. Description of how the program is unique, new, or innovative within Canada, within the region, or institution should be clearly described. Testimonials or assessment data on the program will strengthen the application and should be summarized in the supporting documents. The Student Leadership Award is designed to encourage participation and engagement by a student leader in the annual conference. The Award celebrates significant accomplishments to a campus community and encourages student leaders to consider Student Affairs as a career option beyond graduation. The nominee demonstrates a commitment to understanding and growing in a variety of areas in the CACUSS SAS Competency Model. The Award is the value of a conference registration bursary. The student will receive a framed certificate to be presented at the Annual Conference. Institutions nominating students for the Student Leader Award should be prepared to support the student to attend the annual conference (travel & accommodations). Nominations for the Student Leadership Award must come from a current CACUSS member. Letters of support should be included. The extent to which the student has made significant contributions to their campus community. The level of enthusiasm and support for the student as expressed in the nomination letter(s) of support. The potential and/or interest of the student in considering a career/future working in student affairs or other post-secondary role. A description of how the student will participate and/or benefit from participation in the Annual Conference. Demonstrated growth in some of the SAS Competencies. Nominations which recognize contributions of racialized students, Indigenous students, and students with disabilities are strongly encouraged. Additional consideration will be given to nominations of underrepresented student leaders.